You are probably already aware that I like to find nice old tiles or mosaics especially with the original company name embedded within them. Here is a link to a particularly good collection I put together earlier this year. 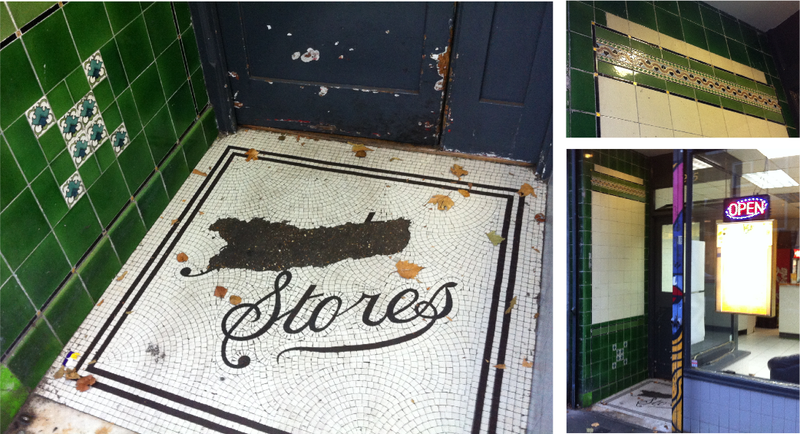 The lovely green and cream tiles in this particular entrance are approx 100 years old and are in stark contrast to the fast food outlet that these days occupies the ground floor here. The mosaic doorway has been as good as vandalised by subsequent owners; the first word having been obliterated, but in a half-arsed way. Surely it would have been easier just to have covered the whole thing?! I know that a while back this shop was a butcher's but I am pretty sure this was not the primary owner. I have been looking at this today trying to work out what name could have been on the top line. It's clearly a short name of only four or five letters ending in "ts".... but where is the possessive apostrophe? Surely a family name as in Evan's Stores or similar would make better sense? But hold the front page! I may be onto something here!! I believe it starts with a "B" and so it's very possible that this could be an old Boot's the Chemist Store. See below for ref of Boots old logo and signage; it's a strong possibility. 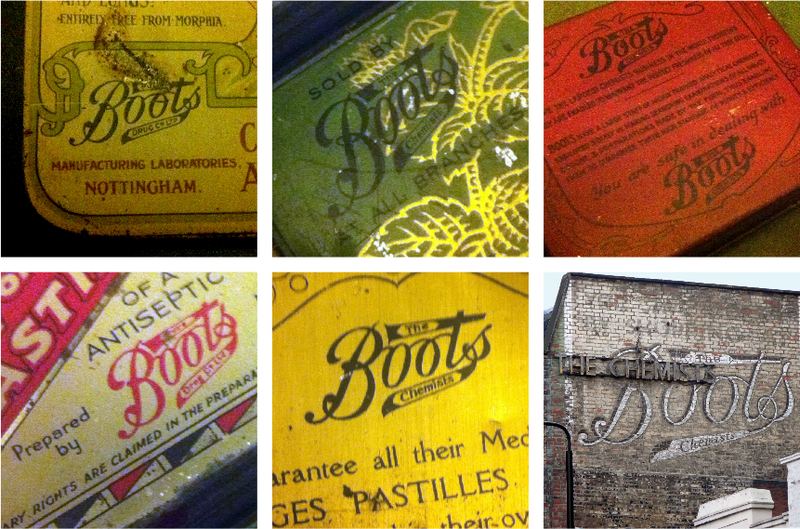 As well as photos of old ghostsigns I also old tins which include the ones shown here illustrating how Boots changed adapted their logo using 'Chemists' or 'Drug Co Ltd' within the underscore. Hmmm... I'm now thinking the shop doorway name doesn't have an underscore under the first word and I might be totally wrong here. What do you think? 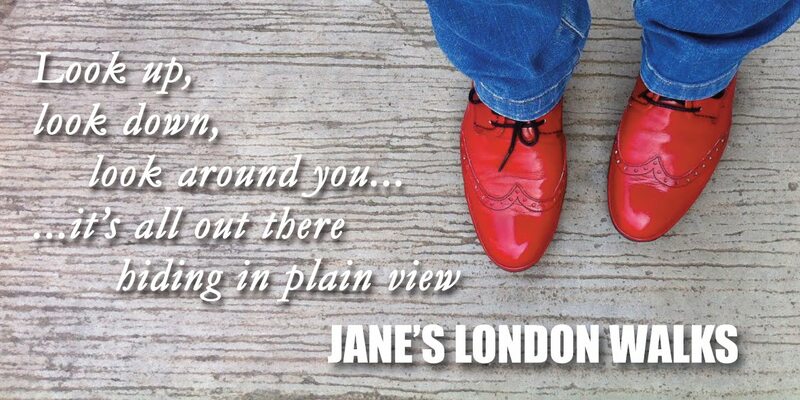 Could it be a Boots Store? Do you have other ideas or, better still, some facts... please do get in touch. 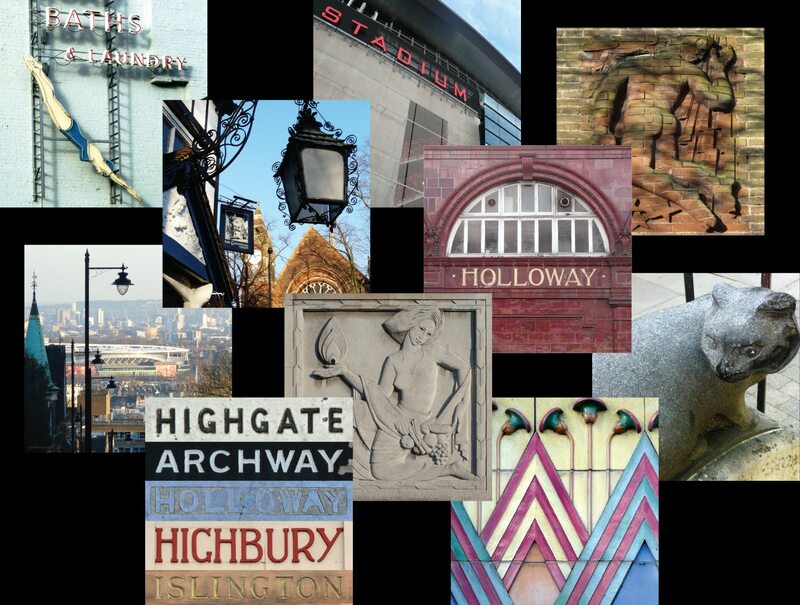 I have a collection of other mosaic obliterations. I will collect them together and save them for another day.